Some good news for Black Berry lovers. The new Black berry Bold which was said to be coming is September is now set for August 9th Launch in Canada. According to technobuffalo‘s trusted sources says that people in Canada will be getting their hands on Black Berry Bold 9900 next week. It is also said that it will come to Rogers. 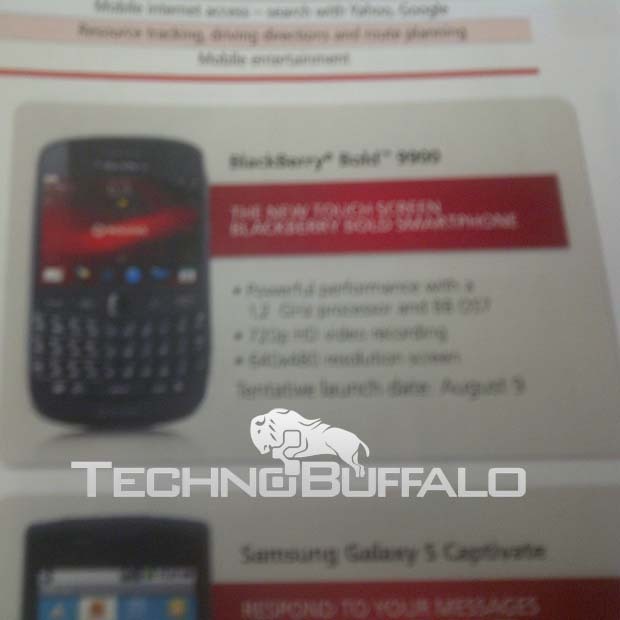 A trusted and proven source sent us this picture this morning, and although its blurry, you can see that theBlackBerry Bold 9900 is coming to Rogers on August 9th. The picture sent to technobuffalo by their sources is not as clear as crystal, but you can see the model is 9900 and in the end if you see it more closely it sates August 9th. It is also expected that it will release in India on August 8th and on Telus on August 15th and on T-Mobile later this month. August seems to be a lucky month for users in regards of Mobile. Black Berry is launching their new cellphone and Apple is going to release their iOS 5 this fall and much more to come. Till now no words are said on the pricing or any details found on pricing for Black Berry 9900. Hopefully a day before we might get some leak for the details and price list.